Cacao, bean-like seeds from which chocolate is made, originates in the Maya area and was grown mainly in Guatemala. A highly valued commodity, the bean of the cacao tree when processed, became the chocolate used in chocolate drinks. Like us, the Maya loved chocolate, but rather than eat it in bars, they drank it. They flavoured their chocolate drinks with spices such as chilli and sometimes they would use honey. They made sure that their drink was frothy and we see many depictions on vases of these frothy drinks. We also see depictions of how they made the drink frothy by pouring the liquid into another pot from a height. 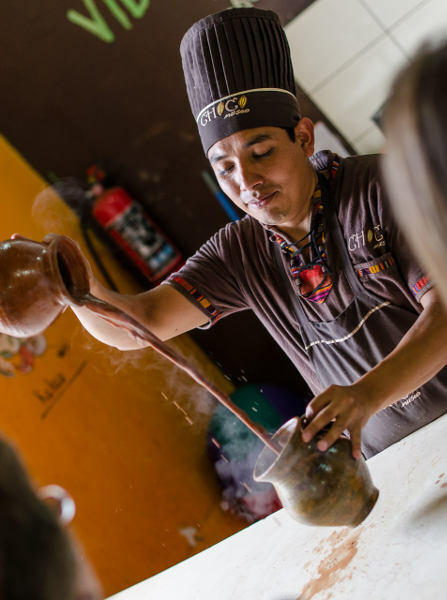 Cacao beans can be roasted, then easily stored and transported – for that reason cacao became a form of currency much later in the in the 1300s. So at this time you could say that the Maya were literally drinking money! What was Maya Writing Like? How did the Maya tell the Time?